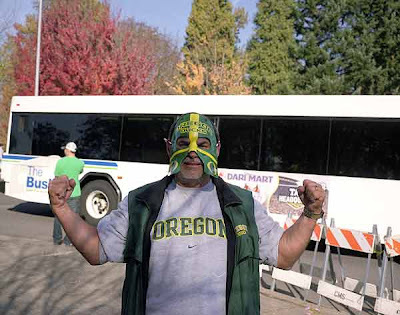 Yesterday I roamed around the parking lot outside the Oregon v. Oregon St. game. I was looking mainly for portraits. It is quite a scene, people drinking, lots of strange costumes, revelry. It should have provided good material but I didn't get any quality photos, and I've been wondering why I didn't. When a person wears a costume they are putting themselves out there as a focus of attention. They expect to get stared at and have their photo taken, and this expectation colors their inner self. So it becomes very difficult to penetrate that costume and get an honest portrait. It's the same reason that Hollywood actors are hard to capture. They are always smiling, putting on a face. They are actors, and it's their job to hide themselves. A little bit of that syndrome was at play yesterday. When I asked folks for a portrait, most of them put on a smile and a pose, and due to my inexperience as a portraitist I didn't know what to say to get around that. The other problem was homogeneity. Wandering around in a sea of 50,000 people dressed in the same colors with the same mindset it was hard to single out anyone as unique. Walking around town is a little different. When I bump into an interesting person it feels like it was supposed to happen. It feels like fate. That is always how the best photos happen. In retrospect they usually feel as if they followed some unwritten plan. Perhaps any one of the 50,000 in the parking lot would've made a good portrait under less homogenized circumstances, but in the parking lot they just sank into a mass. I couldn't feel fate at work. Maybe all of this was in my head and I am overanalyzing, but that's the whole point. If your head's not right and you're not in the proper mood photos don't happen, especially not portraits.